>LabCoats present:LifeStraws at your school! For the Edison Challange Team LabCoats made an original video on 10 steps to setting up a LifeStraws recycling program at your school! 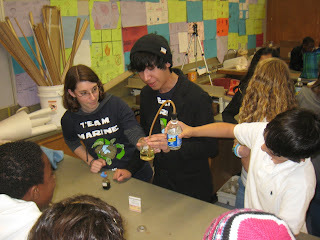 This is Team Marine’s 3rd year participating in the QuickSCience Challenge. The QuickScience Challenge is sponsored by The USC Wrigley Institute for Environmental Studies and Quiksilver, Inc. The Challenge is a multi-faceted competition where teams must create and present environmental lesson plans, develop a multimedia project, write a research proposal, come up with a new solution for an environmental problem and do community outreach. We submitted their project on February 19th but we are far from being done helping the environment! Pictured Above: Team Marine celebrates by going out for some thai food. We carpooled to Lincoln Middle School, Animo Leadership Charter High School, Culver City Middle School, and Santa Monica Alternative School House to give a presentation on our 10 R’s Curriculum. Each school varied with the age group we presented to, but overall we presented to grades 7 to 12. For each group we modified our lesson plan depending on the age group we were presenting to along with the language of our content. We first introduced ourselves and the documentary we had created concerning the negative impacts of single-use plastics and our Ten R’s solutions to the problem. As the video we presented ours Ten R’s power point which had content based on problems of single-use plastics, global warming, ocean acidification and our solutions. Then when we were done presenting we assigned students to four different stations the first one was based on the carbon cycle and explained to them the difference between a source and a sink. The second demo station was on ocean acidification which included dropping eggshells and chalk in vinegar to demonstrate how coral bleaching occurs. In addition to that demo we used a universal indicator to show how carbon dioxide makes the ocean acidic by blowing bubbles with a straw in distilled water. The third station involved two beakers filled halfway with the same amount of water, one beaker covered with a small net and an ice cube placed on both. Then we melted the ice cube on top of the beaker with the net with a hair dryer to show that glacial ice being melted by global warming can cause a higher sea level rise than sea ice melting. The last station included a club soda, a stopper with a tube, and tilted it towards the beaker with distilled water to show ocean acidification to show how carbon transfers to fresh water and makes the ocean acidic by verifying it with the universal indicator. Then after everybody had been to each demo station we played the carbon cycle game to see how much content they retained with station that pertained to it and handed out organic lollipops to those who guessed correctly. Pictured above: Team Marine speaks on the problems currently facing our planet. 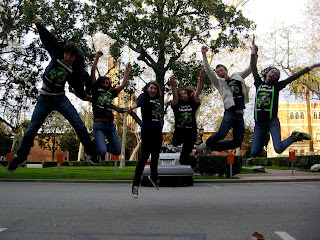 On Thursday February 4th 2010 Team Marine teamed up wit Santa Monica High School’s ASB to put on Focus The Nation. Focus The Nation was a school wide assembly for periods one thru six. 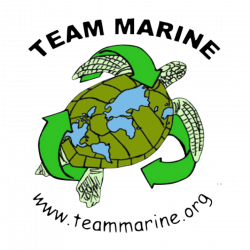 Team Marine brought in many expert speakers on sustainability and the environment such as ACE, Heal The Bay, THe Plastic Pollution Coalition and The City Of Santa Monica. 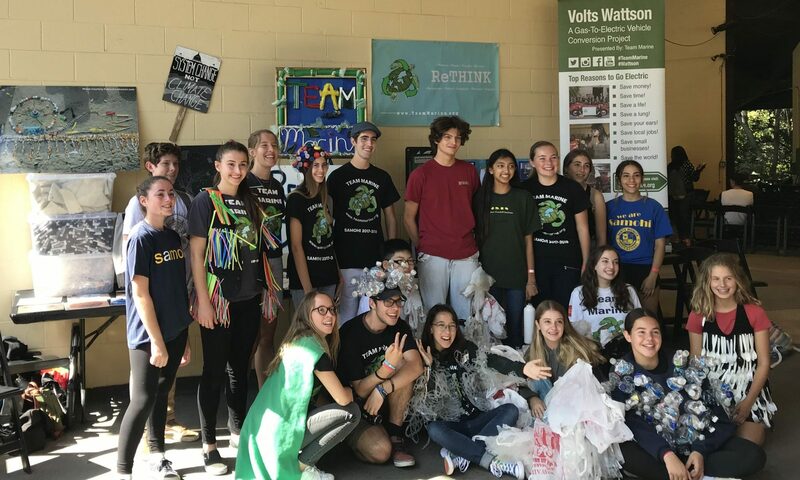 The assemblies were attended by hundreds of Santa Monica High School students who learned about the problems facing our planet and what hey can do to make a difference. Team Marine presented and displayed their documentary “Rethink” to periods four thru 6. 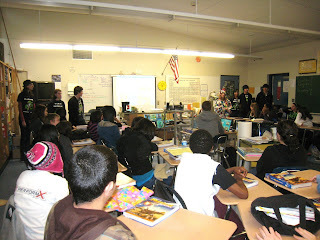 Pictured above: ACE speaks to Santa Monica High School students about global warming. Hey all, We are having another plastic bag march in order to have city counsel speed up its banning of the bags because soon it will be a year when they said they would. It will be a march all around the city and if you see us be sure to honk your horn!!! Hey everybody Team Marine 3 will be at the Youth Enviornmental Convention. We will have a booth that will be operated by two of us at all times. It would be great if all of our supporters showed up and got involved. Thanks for reading and Stay Green!!! Lets ban the bags everywhere who is with me? CITYWIDE The countdown has begun for Santa Monica eateries to begin phasing out their inventory of plastic and Styrofoam containers, environmental demons that will be banished under a new municipal code that takes effect in more than a week. In January 2007, the City Council passed an ordinance that would prohibit the use of expanded polystyrene (Styrofoam) and non-recyclable plastic to-go containers from restaurants and City Hall-managed facilities. While the latter category was forced into compliance last February, restaurants were given a year to make the switch. Members of the Santa Monica High School student clubs ‘Team Marine’ and ‘Heal the Bay’ take to the wet streets Thursday afternoon to raise awareness for the environmental dangers posed by plastic bags. The march coincided with the first ‘Day Without a Bag’ event throughout Los Angeles County. Government officials hope shoppers would make a switch to reusable bags.